Just a quick update to say that Aaron wore a Bum Genius (reusable nappy) all night last night. Even his pampers sometimes leak in the night, especially if he lies on his side to breast feed in bed at some point during the night. Looking forward to the final review. 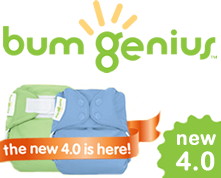 BumGenius is one of the brands I have my eye on.